Once upon a time, a long time ago, a visionary called Tarsem Singh made a movie of such beauty and pathos that it broke my heart. Ever since THE FALL, I've been hoping for him to create something as simultaneously whimsical and powerful, but in vain. IMMORTALS was quite simply unwatchable - dull narrative, bad acting, absurd casting - but worst of all, Singh traded in his singular visual style for a cheap rip-off of Zach Snyder's 300. 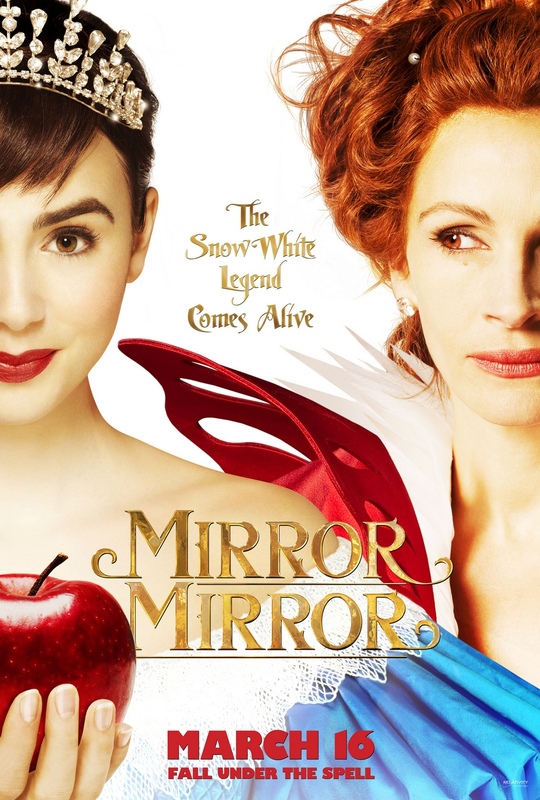 MIRROR MIRROR isn't as bad as IMMORTALS, but it's still very, very disappointing. The good news is that the movie looks wonderful and has a visual wit that was entirely absent in IMMORTALS. I simply adored Eiko Ishioka's stunning costumes (sadly her last film before she died), and I loved the imaginative touches of dwarves using expandable legs, and a mirror that leads to an alternate dream reality. I even loved the casting of the gamine Lily Collins as Snow White, the not unattractive Armie Hammer as the Prince, and was intrigued to see how Julia Roberts would interpret The Queen. The problem with the movie is, however, a fatal one. The script simply doesn't match the production design. I think the problem is that Jason Keller (MACHINE GUN PREACHER) and Marc Klein (A GOOD YEAR) wanted to write a SHREK-like post-modern post-feminist fairy-tale, where ageing queens go for extreme Hollywood makeovers and the dialogue is full of attempts at wry wit. But this stands in sharp contrast to the design of the film, which takes a childish delight in all things magical and wondrous and beautiful. The result is a film that is tonally all over the place, sparse on laughs and awkward in its romance. A tremendous waste of a beautiful production and yet another disappointment from the man who gave us one of the best films of the last decade. MIRROR MIRROR is on release everywhere except Japan where it opens on September 14th.